How to have fresh, organic produce for your family in the cheapest way possible. This is also a great family activity that can be done together while providing the most beneficial foods for your family. ABC TV presenter Colin Campbell says people now prefer home-grown food because it's healthier. There's a backyard gardening revolution going on as people reject store-bought fruit and vegetables, gardening guru Colin Campbell says. Speaking at the Gardening Australia Expo in Brisbane, the ABC TV presenter said people were growing food at home because of concerns about health, cost and the carbon footprint of produce. Plus, home gardening is great fun. "People are concerned about what they're getting," Mr Campbell said. "They want to grow things that are fresh. "This carbon footprint that people talk about - when you transport vegetables from one end of the country to the other, by the time it gets to you it's gone through the transport system, the marketing system, the supermarket system. "Backyard gardening is wonderful for kids, too. "A lot of kids today think that the vegetables materialise on a supermarket shelf." Mr Campbell said he grew up in an era when people grew their own vegetables. 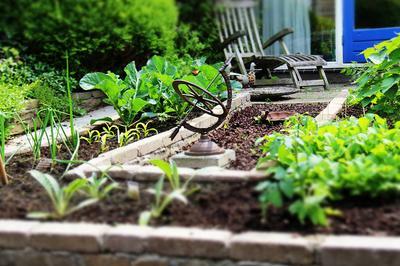 about growing their own vegetables, and secondly, growing them organically. "That was way ahead of water-wise gardening and everything else. "There is an organic revolution going on, and people want to grow their own vegetables organically. "Half the chemicals that are in foods today, that kids are getting thrust down their throats, are most of the cause of things like ADHD and other things. "In my youth there were naughty kids - I was one of them - but we didn't have an illness. "We got good wholesome food, and we got plenty of sun and exercise." Young people are flocking to organic gardening groups right around the country, Mr Campbell said. The backyard food fad is reflected at the gardening expo with an increasing number of exhibitors offering solutions and opportunities for the home grower. Horticulture teacher Claire Bickle, of Organic Gardener magazine, said backyard growing was becoming mainstream. "With things happening in school gardening and vegetable growing, it's becoming part of everyday life," she said. "At the turn of the (20th) century and all through the Depression, a lot of people had vegetable gardens and chickens and eggs. "We went away from it, but it's one of those cycles, and people are coming back to it." The Gardening Australia Expo moves to Sydney in August and Melbourne in October. Time to get your fresh produce with your garden, no more excuses. It cost a little bit of money to build your boxes but then the cost of product that you can harvest is very little.